Here Is Your Chance to Earn Continuing Education Credits and Network With a Variety of OT Professionals in Nevada! Awards will be presented on the day of the conference, and your help is needed to identify the "best of the best" of our professions! Click here to recognize your friends and colleagues for their hard work and dedication to the care of your community! 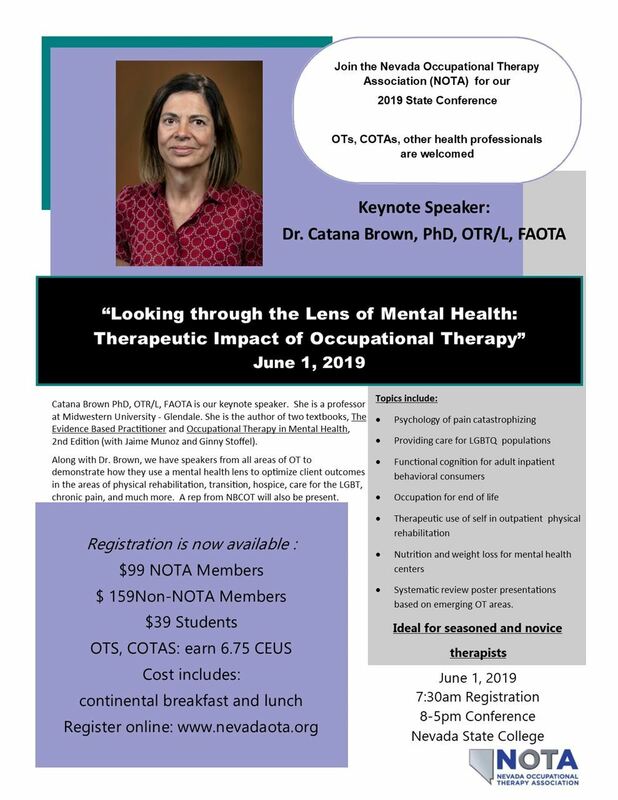 Increase awareness of your company's products and services while being recognized as a sponsor for Nevada's OT Conference! Reach an audience of OTs including clinicians, managers, entrepreneurs, faculty, and students! Connect with therapists who can use and share your products! Provide a $250 academic scholarship named after your company to an occupational therapy student. Company logo will be present on scholarship certificate. Scholarships will be announced at the conference and students can apply after the conference, with deadline decided by the scholarship committee. Increase your company's visibility and become a sponsor today!